One of Argenziano's best-known roles is as the recurring character Jacob Carter/Selmak in the television series Stargate SG-1. He is also a lifetime member of the Actors Studio and was awarded the Los Angeles Drama Critics' Circle Award for his performance as Jack Delasante in Thomas Babe's A Prayer for My Daughter. He was cast in 2007 as one of the potential fellowship candidates in House M.D.—albeit as a fake doctor—but was eliminated. He guest-starred in 2009 in Criminal Minds, in the season 4 episode "Demonology" where he portrayed Father Paul Silvano. He died on February 10, 2019 at the age of 75. ^ "Carmen Argenziano". nytimes.com. Baseline. All Media Guide, LLC. Archived from the original on 4 November 2012. Retrieved August 20, 2017. ^ a b "Profile". carmenargenziano.net. Archived from the original on October 18, 2007. Retrieved August 20, 2017. ^ "'Stargate' Actor Carmen Argenziano Dead at 75". TMZ.com. EHM Productions, Inc. February 10, 2019. Retrieved 13 February 2019. 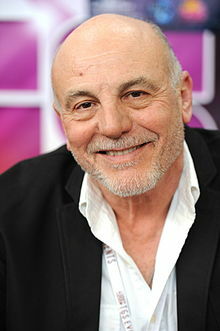 Wikimedia Commons has media related to Carmen Argenziano.